With a camera on a NASA satellite that circles over Earth’s poles, University of California-Irvine professor James Randerson has spotted a near-record number of early-dry season fires burning on the southern and western perimeter of the Amazon forest, including in seven Brazilian states and swaths of lowland Peru and Bolivia. Randerson, a biologist, has created a computer model for forecasting forest fires. Evidence from various satellites indicate that the rainy season just ended shed unusually little precipitation. “It’s the driest we’ve observed in the last 15 years at the onset of the dry season,” he says. Several weeks ago, he forecast a chart-busting conflagration later this month. The many blazes already detected appear to bear out his prediction. 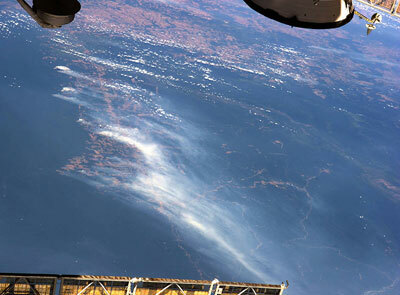 The smoke from multiple fires in the Mato Grosso region of Brazil rises over forested and deforested areas in this astronaut photograph taken from the International Space Station in August, 2014 (photo credit: NASA). In 2000, a team of researchers associated with the British Hadley Center began issuing worrisome computer simulation reports of how Earth’s vegetation responds to global warming. Increasing temperatures off Brazil’s Atlantic coast, they’d noticed, suppresses moisture bound on trade winds for the Amazon rainforest. In forecasts, the scientists found that coastal forests earlier watered by the winds had dried out, turning the jungle into prairie. The sparser vegetation transpired less moisture into the atmosphere, reducing the precipitation blown farther inland. Researchers have learned that half of the forest’s rainfall recycles at least once through vegetation, an effect that – if interrupted – will convert the moist region to a dry savannah comparable to the plains of Africa. Amazon forest – from green to brown by 2100? The British researchers predicted that over coming decades, a moving front of reduced rainfall and less-lush forests and prairie would propagate inland. By the end of the century, the scientists forecast, global warming could turn the entire Amazon basin – an area almost as large as the continental U.S. – from green to brown. In one widely cited paper, they foresaw “the possible climate-driven loss of the Amazon rainforest.” They called this Amazon Dieback. “The good news,” says Nepstad, is that “that scenario has since been revised.” In 2013, after years of painstaking follow-up, members of the original Hadley team published a startling new paper. They concluded that a continental-scale dieback is not likely after all. Their revised simulation took into account new research findings, such as the discovery of deep tree roots that give Amazon woods previously unappreciated drought tolerance. The researchers also incorporated a biological mechanism that some scientists think may stabilize the Amazon: the yet-to-be-proven hypothesis, called carbon fertilization, that increasing amounts of carbon dioxide in the atmosphere can induce trees to grow faster and use water more efficiently. But don’t rest easy. The bad news is that a mechanism not considered by the British researchers might be as threatening to the Amazon as the out-of-favor dieback process: forest fires inadvertently spread by farmers during unseasonably dry years. New research shows that in dry years, fires migrating off farms and ranches can inadvertently convert flame-resistant forest into combustible tinder, increasing the area burned in successive droughts. “That can become self-perpetuating,” says Nepstad. 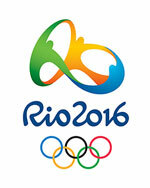 In 2004 Nepstad and a team of U.S. and Brazilian scientists began an unusual experiment. They set rainforest plots, about the size of a golf course, on fire. In a paper published in 2015, Nepstad and his colleagues reported that few trees died, beyond what’s normal, even when the team burned a plot for three dry seasons in a row. “We burned 2004, 2005 and 2006,” says Nepstad, “and it was sort of like: yawn.” However, the burned plots had sustained unseen damage. A thick layer of damp leaves comprises the floor of pristine Amazon rainforest. It’s fire retardant. Without human sources of ignition – blazes set to clear land for crops – such forest rarely burns at all. Until recently, even fires that escaped farmers generally burned so anemically that they spared all but the saplings. Another plot burned every three years behaved similarly, though in this case the big destruction came on the second burn. Nepstad says that the initial fires had punched holes in the leafy canopy. Sunlight and breezes stimulated desiccation of the forest floor. Flammable grasses, unable to thrive in shade, colonized clearings opened by the cumulative burns. The forest was primed, awaiting a spark. The process Nepstad studied on a small scale appears now to be playing out across the Amazon, especially along the drier southern edges, a principle area of soy farming and cattle ranching. Researchers calculate that after the 2010 drought and the fires it unleashed, the Amazon released about two-billion more tons of carbon dioxide than during a typical year – nearly half as much as the entire U.S. releases in a year. Nearly 40,000 square miles of forest – an area the size of Maine – burned in Mato Grosso, the most affected state. Responding to global criticism for failing to protect the Amazon, Brazil has reduced the rate of rainforest clearing by about 75 percent in the past decade. But researchers fear that fire could turn more forest to ashes and cancel out the benefits of new deforestation rules. The loss of biodiversity in the world’s largest rainforest alone justifies serious concern, they caution. But even more is at stake, as the Amazon holds a staggering stockpile of carbon sequestered in tree trunks and soil. The number and size of fires burning in the Amazon usually rises quickly after the rainy season ends in early August. Foster Brown, a biologist at the Woods Hole Research Center in Woods Hole, Massachusetts, has been closely monitoring satellite reports of fire since rains tapered off in late July. “The worst fires have not yet begun,” he said by Skype from his office in the Amazonian city of Rio Banco, where he’s a professor at the University of Acre. Brown yawned as we spoke, exhausted from days phoning communities across the region, urging landholders to delay setting fires till the rainy season begins in a few months.